7.89 points at 19 votes (rank 103). 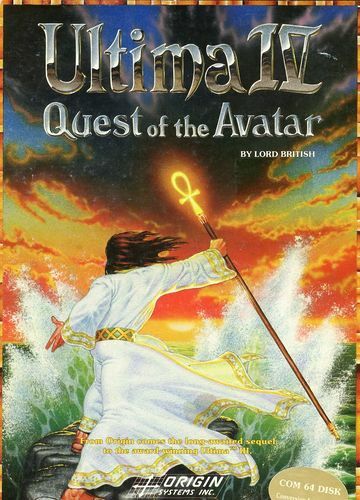 Ultima IV - Quest of the Avatar is the fourth part of the Ultima series. Some time has passed since you as chosen Avatar of Britania have managed to defeat the evil Mondain and his followers. But again it was not granted to the mysterious land under the rule of Lord British to find peace. Although no super-villain threatens the realm this time, the evil is lurking everywhere. And what is the story about the mysterious Book of Codex? Special tasks await you, Avatar! 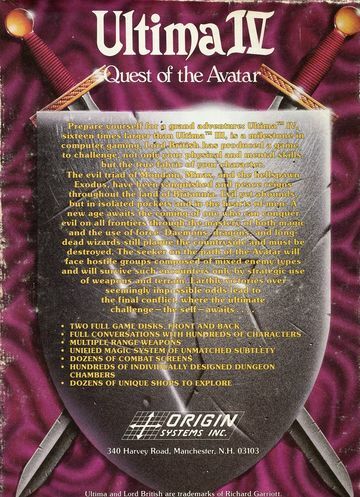 In the fourth part of the Ultima series, the player needs to first endure a kind of medical-psychological examination und for this answer some questions to a gypsy. From this the character values are generated, which for the first time in the series cannot be allocated by the player. 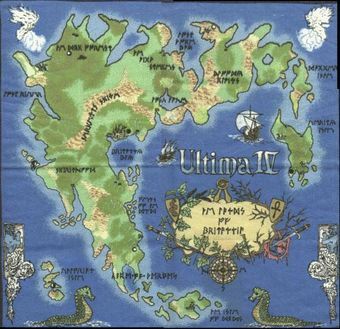 Ultima IV offers an upper world of enormous size in which Avatar and his troup, as usual from the bird's view, can walk around. The game world is in comparison to part three approx. sixteen times bigger. Ghost towns, captive balloons and pirate ships are examples for the diversified design of Britania. What was especially improved, is the communication with the NPCs, which now seems significantly more lively and coherent. Following an old tradition handed down from generation to generation, many signs and signposts in Britannia are written in unique and fascinating runes which were once used by druids for their notations. According to a study, these runes are older than Britannia itself. The superficial wanderer might be confused by this writing, but the clever traveller will not spare any effort to study this writing intently. The aim of the game consists of two parts. The first partial aim is to become an 8-Part Avatar. To reach this, you need to act all your life (in the game) in pursuance of the eight virtues of the Avatar. These eight virtus are Honesty, Compassion, Valor, Justice, Sacrifice, Honor, Spirituality and Humility. For each virtue there is an epiphany, which you get, when you have acted in your life along one of the virtues for long enough. When you have the epiphanes in all eight virtues, you are Avatar and have reached the first partial aim. The second partial aim is directly connected to the first one: As Avatar you need to enter the last haven of evil in Britannie, the Great Stygian Abyss, find in it the Chamber of the Codex of Ultimate Wisdom and enter it. When you have received the last enlightment from the Codex of Ultimate Wisdom, the game is solved. At the start of the game you need to answer seven questions with the choice of a virtue. Depending on the answer, there is a bonus on the each 15 points for INTelligence, DEXterity and STRength. At the same time, the two most used answers determine the final questions and the answer to that then determines the profession and the hometown of the created character who then takes the role of the companion in that town. In the further course of the game you then collect the companions from the other towns. The Bard starts as the only one with a long range weapon. 1 - Honesty Int +3 Mage Moonglow Mariah North of the bridge at the entrance. Below it is a treasure chest (Rune of Honesty). 2 - Compassion Dex +3 Bard Britain Iolo Southeast behind a bridge at the campfire. He carries a box in his hand. 3 - Valor Str +3 Fighter Jhelom Geoffrey In the first room of the Inn. To enter, you only need a key. The only person who can tell you about the progress you made at each virtue is the seer in Lord British's castle. He also gives the permission to get the enlightment for each virtue, when you are ready. For each virtue there are rules in behaviour to which you strictly have to adhere to make progress. Do not pick up the gold (treasure chests) that is lying around in towns, villages and castles! Never betray the blind traders at the Magical Reagents! Give beggars as much gold as possible! Fight as much as possible against evil creatures! Only flee when it is really necessary! Do not attack inhabitants in towns/villages/castles! Do not steal any gold! Do not kill any non-evil creatures, even when you are attacked by them (only make them flee)! Give much gold to beggars! Do not pick up any treasure chests that do not belong to you! Do not attack non-evil creatures! Always answer the question "Art thou proud?" with "NO"! After having received the permission from the seer to get an enlightment, you need to visit the shrine that belongs to the corresponding virtue and meditate for thress cycles. To be able to enter a shrine and meditate there you need two things: first the rune. It is needed to be able the enter the shrine in the first place. Then the mantra. This is a syllable or a word with which you can collect your thoughts and concentrate. Each shrine has its own mantra and its own rune. You will get to know the mantras through talking to people, the runes need to be found with the help of the search command. For each of the eight avatar virtues there is a coloured stone. Six of these stones can be found in several dungeons, the rest at two other places. The blue stone: The Blue Stone of Honesty is in level VI of the dungeon Deceit which lies at LAT: E'J" LONG: P'A" on the Bloody Isles. You need a ship to reach it. The yellow stone: The Yellow Stone of Compassion lies in the V. level of the dungeon Despire. You find the dungeon at LAT: E'D" LONG: F'L" in Serpent's Spine. The red stone: The Red Stone of Valor. It can be found in the VII. level in Destard, at LAT: K'J" LONG: E'I", in the mountains west of the Fens of the Dead. The green stone: The Green Stone of Justice. It is in the VIII. level of the dungeon Wrong, which is located at the position LAT: B'E" LONG: H'O" in the mountains west of Lost Hope Bay. The orange stone: The Stone of Scarifice lies in the VII. level of Covetous. This dungeon is located at the position LAT: B'L" LING: J'M", southwest of the town Minoc, and can be reached by ship. The purple stone: The Purple Stone of Honor. You find it in the II. level of Shame. This dungeon is located at LAT: G'G" LONG: D'K". For this you need to follow a small river into the Serpent's Spine with a ship coming from northwest. The white stone: The White Stone of Spirituality. 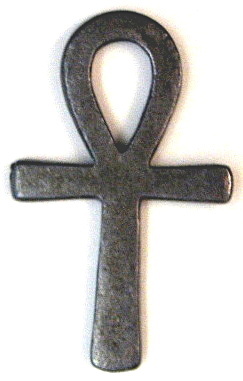 You find it in the middle of Serpent's Spine, at the position LAT: F'A" LONG: E'A". To be able to reach it, you need the Lighter-Than-Air-Device, a balloon! You can find the Bell of Courage if you search with a ship at a flat place in the water in the ocean at N'A" L'A". The Book of Truth can be found in the Lycaeum A'G" A'G" in the shelf "T". The Lord tells you the first part of the Word of Passage: "VER"
You find the Skull of Mondain if you sail to the three volcanoes in the sea P'F" M'F" during dobule new moon. At Serpent's Hold A'P" A'I" you search the training mat until you find the Mystic Weapons, which are the only ones that work in the chasm. The Lord tells you the last part of the Word of Passage: "COR"
In Empath Abbey A'E" B'G" in the oak grave lie the Mystic Armors. The Lord givess you the second part of the Word of Passage: "AMO"
The town Cove lies at the Lock Lake and you only get there with the "Blink" spell. In Cove A'B" B'G you enter the temple of virtue where you find the Candle of Love. The Wheel of HMS Cape can be found at N'H" G'A"
You can only get the sextant, when you ask the thieves for item "D", which is not on the list. This little helper is an absolute must in Britannia, because it gives the corresponding location of the user in latitude and longitude. Britannia is divided into 16 x 16 big blocks, which are again divided into 16 x 16 small fields. Example: Lat. D' L'', Long. M' J'', short "DLMJ" or DL MJ means, that you are in the map block on D latitude and M longitude and within this block in the field on L latitude and J longitude (in Vesper). Map of Britannia without labels. Map of Britannia without labels and legend. Cheap food is available in Skara Brae, Hanse-players and pirates surely would love to do ocean-going trade between Paws and Buccaneer's Den, but disappontingly they had to find out that the herb woman does not buy anything.... Furthermore, you need to be aware that you need to own at least one Black Pearl already to be able to enter the herb shop in Buccaner's Den with the spell "Dispel". The plants can only be found at double new moon - and please stay away from the place for a while before you can harvest again. Gate Travel G A F H teleport to a moon gate of your choice – from EVERYWHERE! HUMIlity Patric Moonglow + answer counter question with "no"
MANTra Cromwell Moonglow ! mantra of the shrine of honesty ="AHM"
NATUre Julio Britain + answer counter question with "no"
PRIDe Mentor Britain + answer counter question with "no"
VALOr Sir Hrothgar Jhelom + answer counter question with "no"
RED X Jhelom + answer counter question with "no"
PEACe big Guard Yew + answer counter question with "no"
RUNE Talfourd Yew + answer counter question with "no"
FABRic Flamis YEW + answer counter question with "no"
SKULl Jude Minoc ! answer counter question with "yes"
SHRINe Merida Minoc ? answer counter question with "no"
QUESt White Skara Brae + answer counter question with "no"
OM Ankh of Spirituality Skara Brae ! answer counter question with "no"
HANG Faultless Magincia + answer counter question with "no"
MANTra Faultless Magincia ! Mantra for pride = "MUL"
HAUNt Heywood Magincia + answer counter question with "no"
A good Avatar only kills evil monsters. Although you will get a companion of each of the eight professions in the course of the game, it is not entirely unimportant which character type you choose at the beginning. This character needs to lead the group during all of the game, so it is always at the 1st position in fights. Therefore it should be able to wear good armour as it needs to bear a lot at that position. Furthermore is the experience level decisive for the number of members that can be taken into the party. To be able to fill up the group to four characters, the "leading character" needs to have reached at least level 4, for 5 members level 5 and so on. So the character should be a good fighter, so it can raise its level quickly. All these requirements fit the Paladin. He can use very good weapons and armour (better ones than e.g. the fighter), and he is also a rather good Magic User and with this the ideal leader. In each town (not in villages or castles!) you find exactly one character that is going to join the party, when the leader has reached the corresponding level (exception: the town to which the own character belongs). When you enlarge the group this should not happen without a plan. Weak characters as e.g. the Shepherd should be taken into the group at the very end. If you start with a Paladin, you basically have reached the 3rd level, which means that you can instantly add two new characters to the party. Recommendation: a Bard and a Druid or a Mage. Then you should get the Tinker, Ranger and last the Fighter and the Shepherd. It is important that at the very end you have all 8 characters when you enter the Great Stygian Abyss. At the start you should directly visit Lord British's castle and speak to Lord British. Then go to the seer who is also in the castle. In contrast to Ultima II and III is the seer in Ultima IV for free, which is easy on the purse. You can ask him for all the eight virtues and he will say what the status of them are with you. Talk to each character that you meet in the course of the game. At some places you can talk with highly odd characters, so e.g. in the castle of Lord British with the water (!) in a certain room or in the Ruins of Magincia with the snake by which you are attacked. Also consider characters that are behind closed doors in the inns and in towns. Sometimes you need a key to get to these characters. You should also walk around the surrounding walls of every town / village / castle. Often important persons hide there. Absolutely look out for secret doors that are in many walls in towns, villages, castles and dungeon rooms. The secrect passages can be recognized by looking closely. These permeable stones play an important role in the dungeons where they are used as a type of switch. When entering these permeable stones, often secret doors and exits open that lead to the most important places and items. So do not despair if there does not seem to be an exit in a dungeon room (except for the way back). Look closely, maybe there is a permeable stone somewhere which makes an exit appear when entering. Crystals can help you navigate. "Dispel Field" is a must, same with "Light". The balls give abilites but also steal life points. The virtue of the dungeon determines the abilites. Never drink from the springs. The spells X, Y and Z are obligatory. You need to be 8 Part Avatar - The party needs to have all eight members - You need to own a ship - You should own the Wheel of HMS Cap - The party needs to be equipped with Mystic Armour (possibly also with Mystic Wapons) - You need to own the Bell of Courage - You need to own the Book of Truth - You need to own the Candle of Love - You should own the Skull of Mondain - You need to know how the eight Avatar virtues combine from the three principles Truth, Love and Courage - You need to know the Word of Passage - You need to know the One Pure Axiom - You need to own the Key of three Parts - You need to own the eight coloured stones that belong to the eight Avatar virtues. You know the way to the island, it is where the Shrine of Humility is. First you go into the direction of the Shrine and go around the island on the left. On the westersn side you find an entrance that leads to a big bay in the middle of the island. Before using this entrance you need to use the Magic Wheel! After some fights against pirates you land in the east of the bay, follow the swamps further to the east and then turn to the south. You see a net-like structure made of fire with an orange-coloured lava field in the middle. This field is the entrance to the Great Stygian Abyss. Now you enter the lava field. Now use the Bell of Courage, the Book of Truth, the Candle of Love and the Skull of Mondain. Then enter the Great Stygian Abyss. In each level of the Abyss there is an altar. At each altar you need to use one of the eight stones and answer a question. If you used the right stone, the altar turns into a ladder that leads one storey lower. At the end of the eight level waits the Chamber of the Codex of Ultimate Wisdom! The question for the Word of Passage you answer with Veramocor and answer the questions successively with: Honesty, Compassion, Valor, Justice, Sacrifice, Honor, Spirituality, Humility, Truth, Love, Courage, Infinity. 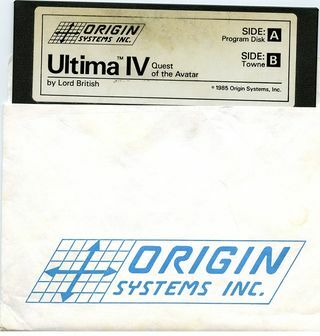 There are several cracked versions of Ultima IV, that partially have trainer menus. Typical options are unlimited spell energy, food, torches or keys. FXXS: "Significantly more taste than Ultima III, group inventory instead of character inventory and smaller towns reduce some of the repeating effort and with the remastered version one can also finally switch off the time limit per move and use the joystick for the controls. The big hatch that is left is the too big influence of luck for the gold chests and with the promotions. It is a pity that you cannot sell herbs. Close 9 points." 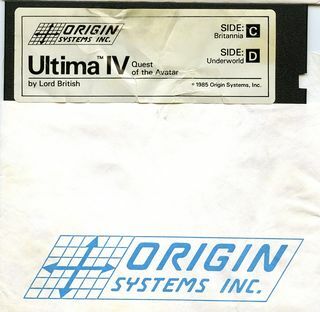 The version "Ultima IV Remastered v2.2.1" by the "Genesis Project" offers next to different cheat modes and a savegame editor also numerous improvements, bug fixes, SuperCPU support, control with joystick and new graphics in the intro part (ported from the FM-Towns version). This version is available as D64, D71, D81 and EasyFlash cartridge image and also runs on CMD FD and CMD HD (see Links). For the gallery the least moves until all eight companions are recruited count. It is played with the d81 version "U4remastered". "Idle without pass" is allowed to be able to play in the emulator with faster speed. CSDb - Release No. 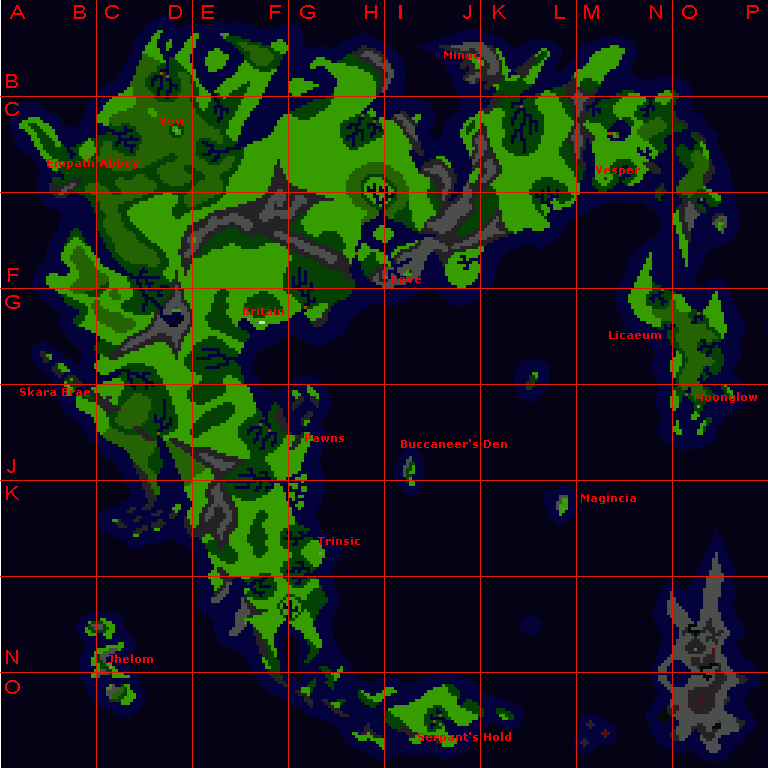 138772 Ultima IV Remastered v2.2.1 by "Genesis Project"
Ultima IV remastered graphics from the status of 2015. This page was last modified on 31 October 2017, at 17:48.